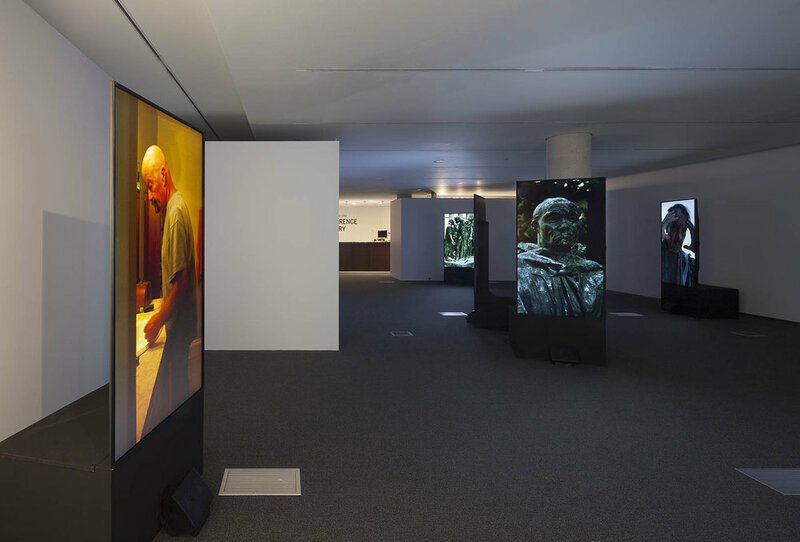 Titled The Burghers of Vancouver, the exhibition has been put together by Adad Hannah, a photographer and video artist who works in Vancouver and Montréal, and Quebec filmmaker Denys Arcand whose latest film, An Eye for Beauty, was released in France in November 2014. At its heart is a new video installation that revisits the idea of the urban monument by taking apart and putting back together the sculpted group using actors. The play tells the story of six people looking for temporary work who are hired by a mysterious patron to embody Rodin’s work in a living sculpture in downtown Vancouver. An anonymous poet, an older lady who only speaks her native tongue, a smuggler, an athlete, a laid-off worker and a former junky meet every day, dress up as burghers, pose for the whole day in front of the Vancouver Art Gallery and then go home at the end of the day. Each takes the pose of one of the six figures making up the group Les Bourgeois de Calais by Rodin and recounts what led him or her to accept this work and how he or she experiences this remarkable project, which seems to be taking place to the indifference of the public. The project goes from private lives to an extreme representation of the social mask in which the highlighting of the images of heroic submission and sacrifice represented by the event of 1347 sculpted by Rodin is embodied in a pretence that is theatricalized but devoid of drama. Here, the monument to the glory of the sacrificed burghers becomes a performance subjecting temporary workers to a physical constraint that imposes – in exchange for payment, silence – immobility and anonymity on them. The reference to history or to a foundation myth that goes back to an episode of the Hundred Years’ War between the English and the French in that strategic place for the two kingdoms is tempered here, while remaining buried in the memory of the work, by the mixed nature of the group of actors whose suffering comes from the long-term unemployment or the marginalization that affects the powerless in globalized big cities. Excerpt from Catherine Bédard's text for the Centre Culturel Canadien.